This spinach salad has a little bit of everything - sliced mushrooms, croutons, red onions, chopped bacon, hard cooked eggs and a drizzle of our sweet onion vinaigrette. 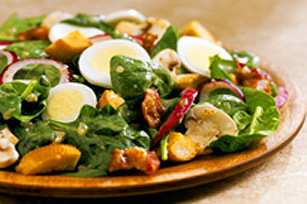 Now that's a spinach salad recipe! Combine 8 cups packed, washed and torn spinach leaves with 1 cup sliced fresh mushrooms and 1 cup croutons. Add 1/2 red onion cut in rings, 1/2 cup chopped cooked bacon and 4 sliced, hard cooked eggs. Warm 1/2 cup Kraft Sweet Onion Vinaigrette in microwave on MEDIUM power for 30 seconds and toss with salad. Bacon bits can be used in place of chopped, cooked bacon.